LOL!! The last one made me giggle. I was just thinking about what my next tattoo will be. Post to come in the next week. 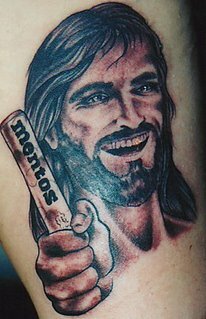 Ooooh Allison, are you going to get a Mentos Jesus tattoo? Because that would be so cool! 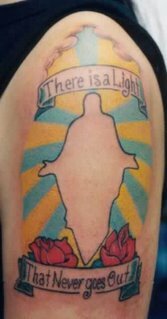 Although a Smiths Jesus tattoo would carry more indie pinache. Kelly, you can post wherever your little heart desires. Is that Mentos Jesus or Mentos (Hugh) Jackman? That'll pack em in won't it? Do you think Jesus would find it too whiny if I got a tattoo that said Please Please Please Let Me Get What I Want? And gee, where to put it? Jesus just wishes he was Hugh Jackman, Dale. He always wanted to do the Wolverine thing - raaaarrrr! 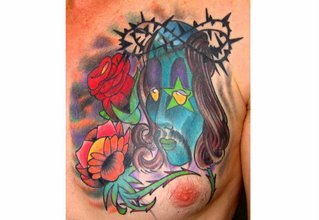 As for the please please please let me get what I want tattoo - Jesus seems to like excessive pleading, but you'd have to use teeny tiny font. I always figured Jesus liked Mentos. I mean ... you gotta keep that breath fresh when you're speaking "the word." Blasphemous! Everyone knows Jesus is a Tic-Tac guy. And they seem to keep his teeth their whitest in addition to giving him minty-fresh breath, Will. Jesus knew how to put his best image out there. Oooh starting a religious war, are you, John? The Mentonites vs the Tic-Tacians. I foresee thousands of years of feuding. You are coming down on the side of the Mentonites, then, JACC. I shall remember that when I am handing out uniforms for the forthcoming holy wars. That third tattoo brings a new meaning to "negative space." Too true, PF! Makes me want to write lyrics in there or something. Oh wait, the lyrics are already underneath.